At first glance, you don't know what is going on with this woman. At first I thought she was in some sort of sling-type contraption. A closer look shows that she's playing with a hula hoop, although at the same time she seems to be doing a very lame "Walk Like an Egyptian" move. Then she's got her leg up--do you trot or dance like that when you're hula hooping?--and you're not really sure what that black thing is on her leg. Is it a awkward-looking water bottle? If you look again, this seems to be her boot top. But then why does her boot show through her purple pants? Is the leg ripped? But maybe those aren't her pants at all. Perhaps it's a strange apron or leggings of some sort. 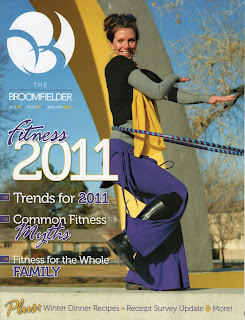 If so, why is she hula hooping/Walking Like an Egyptian in a purple apron-like-legging-thingie? And what's with that yellow cloth hanging down from her neck? Is it a scarf, or an ugly snot rag? This image is enough to give you a headache, so don't think about it too much. What the hell was that photographer thinking?! Also, I noticed her pants/purple drapes are tied to the back of her pants, making it look like she’s going to trip if she puts that foot down. It's a style. Dancers and performers like to wear unusual clothing. And that's her boot. It's not a water bottle. I guess I can see how this looks a bit silly to someone who isn't used to being around cultured people. I think this is really immature. and also, this style of clothing goes back to the times of street performers and gypsy-like people. they wore rags. now, unusual, different and interesting new performing arts are more appreciated and performers dress this way still because it is simply the style, kind of homage to our less fortunate predecessors. and hula hooping is beautiful. it's called Hoop Dance. look it up on youtube sometime, if you're not impressed then you are just jealous that you have little or no talent whatsoever. I love to hoop and still think this is hilarious! Its all in good fun, i mean, look at the site your on, and in all honesty a lot of hoopers look fab out there in their eccentric outfits but I have seen quite a few, including this chick, who just missed the bloody mark...ibut then again unlike her i have never attempted hoopdeance in english horse riding boots...leading me to think they are exploiting hooping altogether as a fashion and a passing trend. I kind of liked it better before it exploded and was a little more culty and personable. I have enough trouble with non hoopers seeing me with a hoop and thinking i am either a bored housewife or a dumb hippie to take the fashion of it so seriously. relax!